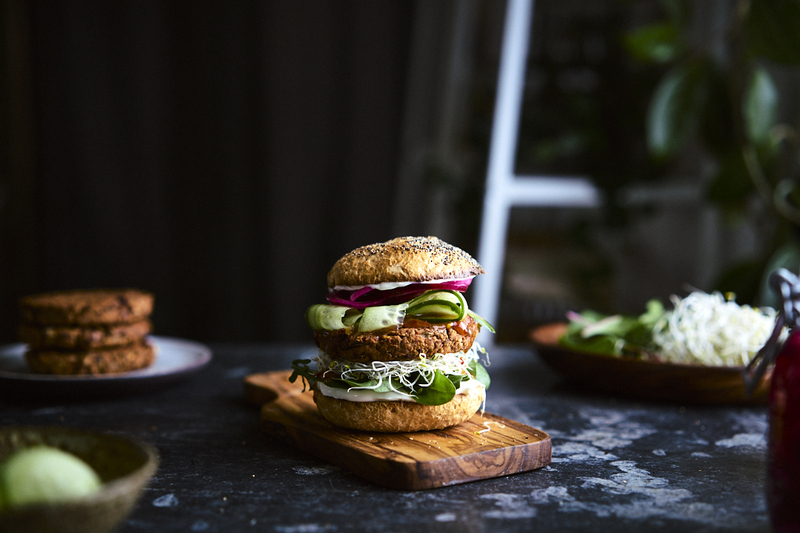 Plant based burgers, burgers, burgers – you gotta love ’em! At least I do and Rod definitely does. So in this video I wanted to share my three go to plant based burger patties and how I like to dress them. You’ll find all the full recipes below as usual. 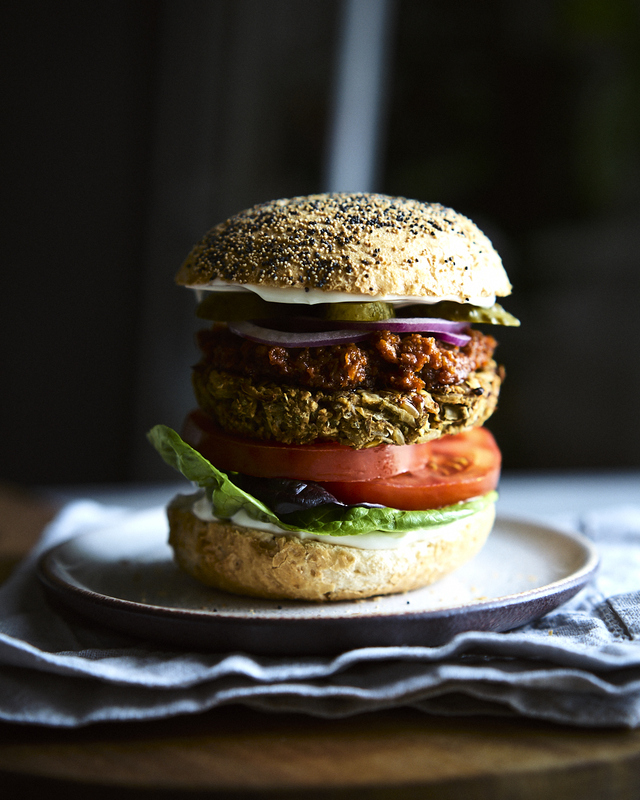 The three burgers are all based on different legumes and two of them also contain a grain. On top of that there’s plenty of spices and flavouring to make them a taste sensation while being totally nutritious. I like to use oats blended into a coarse flour to give bind and bite so you’ll see that throughout. Otherwise they are all unique and I have chosen to layer them with different condiments and veggies to bring out the best of the flavours in the patties themselves. 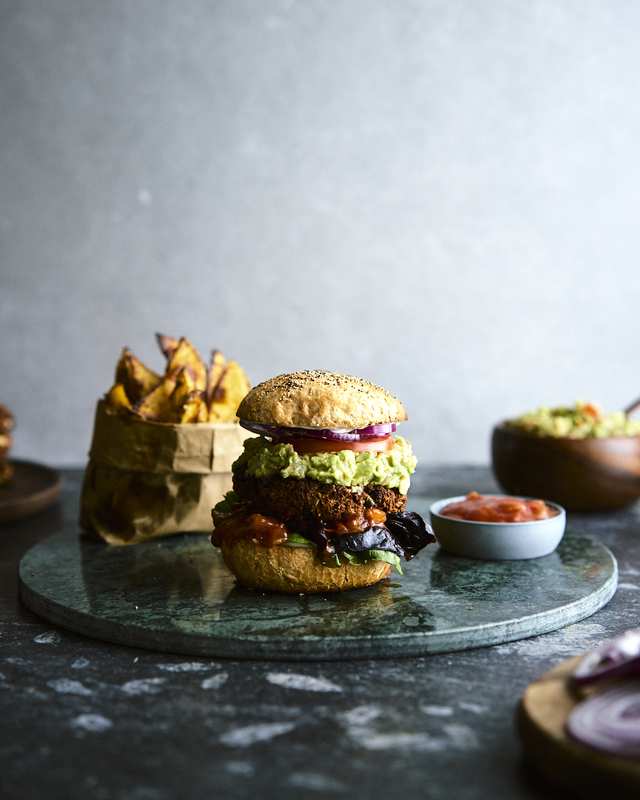 One of the burgers is inspired by Mexican flavours while another one has more of a satay flavour and the third one has a nice herb touch which goes great with pesto. Maybe it seems a little OTT to create the burgers based on different cuisines but I wanted to give you some ideas that reach a little bit outside the box. 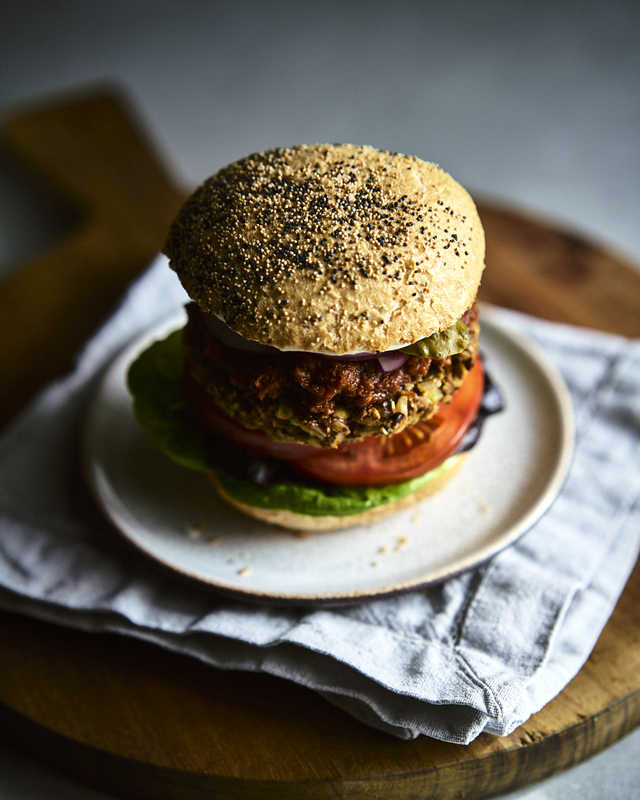 If you wanted a more plain burger I’d simply remove the spices in either of the recipes and focus on adding a little soya, liquid smoke, smoked paprika and black pepper to create more of a plain yet umami base. Then you can go wild with your favourite classic toppings. 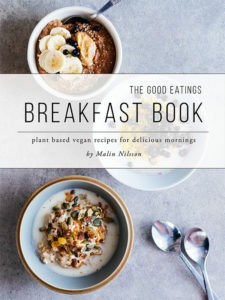 Looking for more meal ideas? Check out my week of series: 5 breakfasts, 5 lunches and 5 dinners as well as 5 sweet snacks. Preheat your oven to 180 degrees celsius, fan assisted. Crush your walnuts roughly in a pestle and mortar, making sure you leave some larger chunks to give a crunchy bite to the burger. Place the crushed walnuts along with all the other ingredients in a large mixing bowl. Mash roughly with your hands and mix the ingredients together very well. Form six patties and place on a lined baking tray. Bake the burgers for 25-30 minutes in the middle of the oven,flipping after roughly 15 minutes. 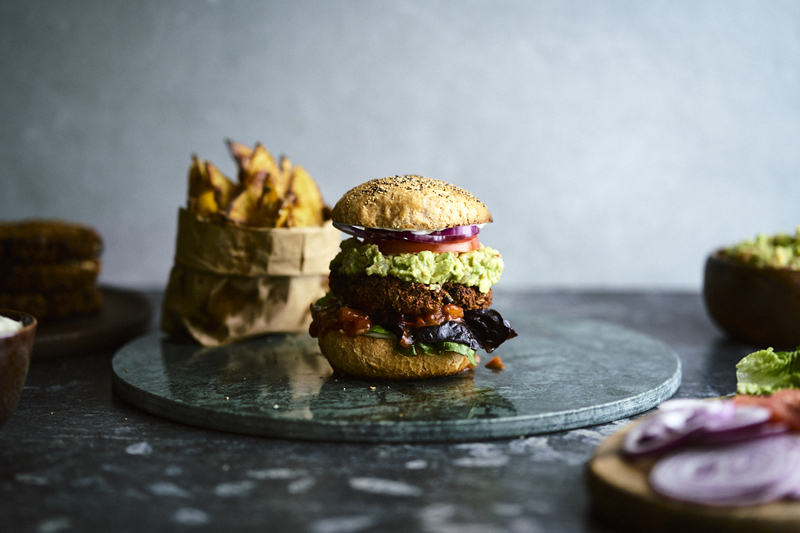 Layer your burgers into your toasted bun of choice along with vegan mayo, lettuce, chunky salsa, guacamole, tomato and onion rings. Make a flax egg by mixing your milled flaxseed with the water and soya sauce. Then set it aside for roughly 15 minutes to make a gel like consistency. Over medium heat saute your onions until translucent in a little water or oil. Then add your garlic and saute another minute before adding your mushrooms. Saute the mixture for another 5 minutes or so until the mushrooms are glossy. Place the fried veggies along with the flax egg and all the other ingredients in a large mixing bowl. Mash it all roughly with your hands and mix the ingredients together very well. Form four patties and place on a lined baking tray. Bake the burgers for 20-25 minutes in the middle of the oven, flipping after roughly 15 minutes. 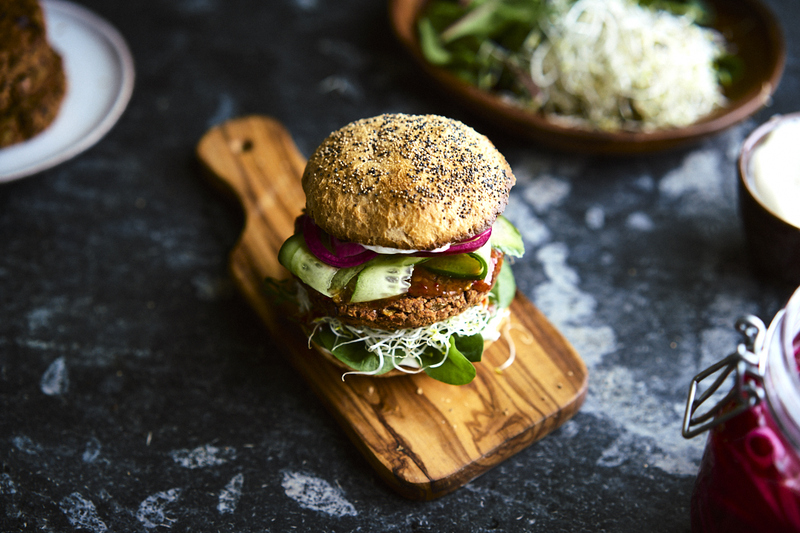 Layer your burgers into your toasted bun of choice along with vegan mayo, green leaves, alfalfa sprouts or other sprouts of your choice, sweet chili sauce, cucumber ribbons and pickled red onions. 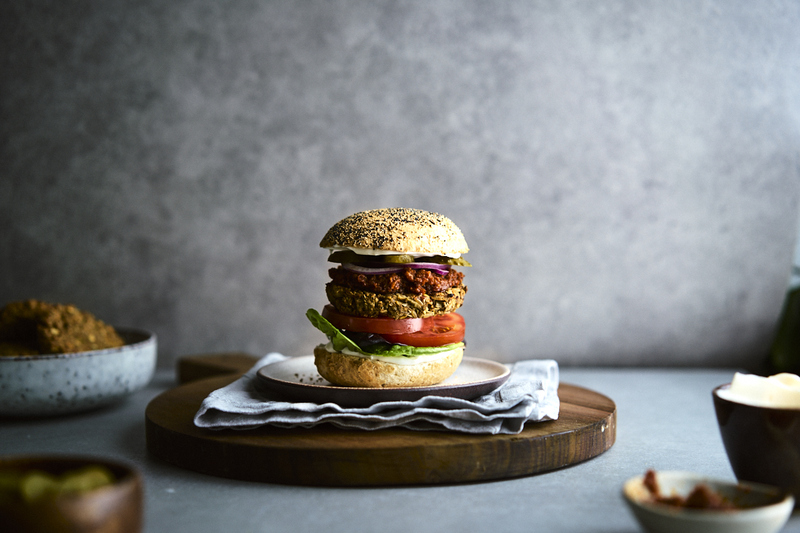 Layer your burgers into your toasted bun of choice along with vegan mayo, lettuce, sun dried tomato pesto, sliced pickles, tomato and onion rings.